√. Hollowed-out star-and-moon design for higher-resolution projection. High-power LED light bulbs, for projection from distances up to over 32 feet. √. Cute design, with piano paint + full-body UV craftsmanship, permanent shine, won’t scratch or chip. √. 9 different light settings, including warm white, blue, red, and green. Can select a single color or multiple at once. √. Multi-functional remote control - Includes buttons for the power, timer, light settings, rotation, and music. √. Silent rotation - Starry night light makes no noise when operating, so it won't disturb you in your sleep. √. 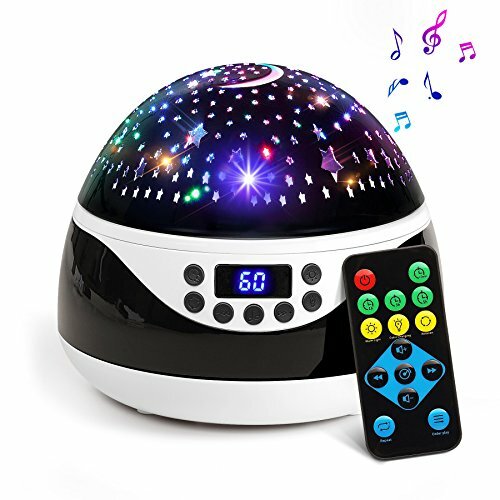 Plays music from memory card (supports hot swapping), high-quality speaker for enjoying the pleasant sound of a lullaby without the need for a third-party electronic devices. 2018 NEW MODEL - Remote control star projector, powerful functionality, high-resolution star and moon projection, global design patent. If you have any questions about this product by AnanBros, contact us by completing and submitting the form below. If you are looking for a specif part number, please include it with your message. Candle Choice Set of 10 Flameless Candles, LED Votives, Flameless Votive Candles with Remote and Timer, Long Battery Life, Battery Included.